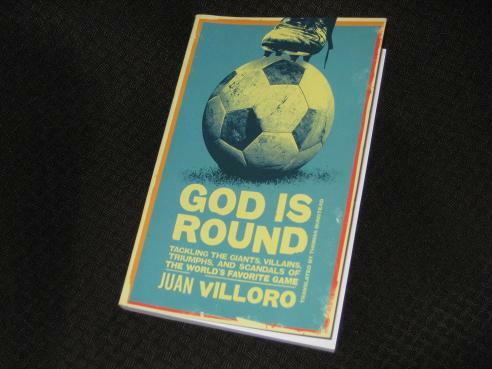 God is Round (translated by Thomas Bunstead, review copy courtesy of Restless Books) is a collection of essays on football by the Mexican writer Juan Villoro. Over 250 pages, Villoro explores a variety of issues connected with the sport, comfortably walking the line between enthusiastic fandom and detached analysis. While there’s little unique to his pieces, the view from Latin-America lends a slightly different slant to his opinions, particularly for those whose football reading has thus far been a diet of mainly European texts. The book is divided into thirteen sections, many of the longer ones subdivided into mini-essays of a matter of pages, making God is Round an easy book to dip into. Villoro begins by talking about fans and their importance, explaining how he came to support his team and theorising on the stoicism he finds in the average Mexican fan, a philosophy made necessary by decades of heartbreaking failure. There are shades of Fever Pitch here as he looks back at his first stadium visits in the company of a father whose team the young Villoro will later reject. Football’s like fiber in your diet: you don’t want it to be all you have, but a certain amount is good for clearing you out. People bring a lot to football, and so a lot gets eliminated there. We can hardly judge it by the sublime protocols one associates with opera, given that its very reason is to vent emotional excesses, to let the lunatic inside each of us take control for ninety minutes, so that the person who comes home from the match might be, if no great humanist, at least reasonably normal. However, when it comes to coping with the stresses of the beautiful game, some are certainly more equal than others, and Villoro discusses how a nation’s history and character can contribute to success or failure in major tournaments (coincidentally enough, I read this section around the time England were proving Villoro right with their dismal performance against Iceland…). God is Round is an enjoyable read, but it’s by no means perfect. In a short discussion on Facebook, a couple of dissenting voices were less than impressed, and some of their points were certainly valid. The nature of the book, a collection of essays pulled together for the volume, means that there’s a lot of repetition, with Villoro fond of certain anecdotes and willing to pull them out whenever he feels the need. The first mention of a goal by Lionel Messi which is almost a perfect recreation of Maradona’s ‘goal of the century’ is interesting, particularly when Villoro compares this act with Borges’ story ‘Pierre Menard, Author of the Quixote’. However, by the time the fourth mention comes around, the anecdote has clearly outstayed its welcome. It could also be argued that there’s a slight lack of flow to God is Round. The section I mentioned above, ‘The Football and the Head’, works well precisely because it’s a cohesive text, with a progression in the ideas. This doesn’t always work in the rest of the book, with the whole seeming a little disjointed. When you add to this the fact that much of what Villoro says will be more than familiar to the well-read, lifelong football fan, you can understand those who are less than impressed by the book. Also, while God is Round may not be destined to join the classics of football writing, Villoro is generous enough to point the reader in the direction of those books that have. He mentions one of my favourite football books, All Played Out, Pete Davies’ epic description of Italia ’90, and the frequent allusions to Eduardo Galleano’s classic Football in Sun and Shadow had me searching for a copy on the library database long before I’d reached the end of the book.